The McCurry family operates the award-winning McCurry Angus Ranch near Burrton, Kan.
BILOXI, Miss. — It's time to announce the Beef Improvement Federation's national Seedstock Producer of the Year award. And the winner is … a leading farm family from rural Kansas. This family is using modern technology to constantly improve beef cattle production through the development of improved bulls and heifers. We recently learned about Tyson and Emily Mullen in western Kansas. Emily McCurry Mullen grew up in south central Kansas as part of this award-winning farm family at the McCurry Angus Ranch. Her brother John McCurry leads the Angus operation today. The McCurry family has deep roots in Kansas agriculture. Five McCurry brothers started the Angus operation with two heifers in 1928. The oldest of the brothers was A.J. A.J. 's son Andy met and married Mary who came from an Angus cattle-producing family in Tennessee and was getting a master's degree in meat science at Kansas State University. Andy and Mary moved to south central Kansas and had Emily and John. Through the decades, the McCurry family has actively shown cattle and worked to improve the breed. "In the old days, it was their way of marketing," John McCurry said. "They would take bulls to the fairs, do well at the shows, sell the bulls and go back for more." Emily and John grew up in this tradition and went to lots of cattle shows. "We did it as a family," Emily said. "It taught us hard work and responsibility." They were active in 4-H and the Angus youth association. John served on the national junior Angus board. John joined the livestock judging team at Butler Community College and then K-State. At one contest, he met a young woman on another judging team and ultimately married her. They now have three children of their own. After graduation, John returned to the family beef business full time. At that point, there were about 70 Angus cows in the herd. Today, McCurry Angus Ranch runs about 1,000 cows, most of which are home-raised. The family sells pure-bred seedstock to beef producers across the nation. Continuous improvement is a theme of the McCurry Angus operation, as demonstrated by their performance at cattle shows through the years. From 2003 to 2005 at the National Junior Angus Show, Emily had the champion female one year, the reserve champion female the next year, and the champion bull in the year after that. "Since we started going to the Kansas State Fair again in 2006, we've had a grand or reserve champion female every year but one," John said. McCurry Angus won at the North American show in Louisville in 2008 and at the American Royal in 2010. In 2016, the National Western Stock Show in Denver started a competition for pens of heifers. "We won in 2016 and took reserve champion in 2017," John said. Such success in the show ring translated to high quality bulls and heifers which the McCurrys could sell to beef producers. Beyond that, the McCurrys are using emerging technology to measure and improve the characteristics of their cattle. Today's cattlemen go far beyond the visual evaluation of yesteryear. Data from expected progeny differences (EPDs) can scientifically project future performance of cattle breeding stock and offspring. Now even more horizons are opening in beef production. "Every cow and bull on our place has been DNA tested," John said. "This confirms the genetics of the cattle we're producing. We also get an accuracy credit (from the breed association) towards our EPDs." Such data helps the McCurrys work toward improvement of their cow herd, while retaining the visual quality, sound structure, and high performance. "We want to build the best cattle we can," John said. He credits his parents for their drive to improve. "This is truly a family operation," John said. McCurry Angus Ranch is located near the rural community of Burrton, population 901 people. Now, that's rural. 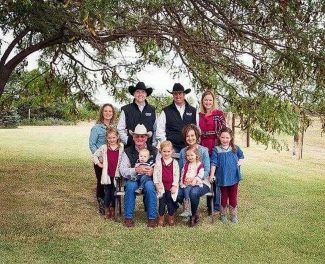 In 2015, the McCurry family was honored as the Beef Improvement Federation's national Seedstock Producer of the Year. We commend John McCurry and all this family for making a difference with a commitment to excellence and continuous improvement — and that's no bull. Audio and text files of Kansas Profiles are available at http://www.kansasprofile.com. For more information about the Huck Boyd Institute, visit http://www.huckboydinstitute.org.